When I began my dissertation, I was certain that I wanted to include a section that would explain my teaching and learning techniques, with the goal of indicating how my approaches to teach and learning influenced the way I conduct research. As discussed in the section, “Transformative Intellectuals: Teaching Opposition Practices in Academia,” I have worked hard to develop my ability to combine my professional, personal, and academic experiences in order to positively affect their respective spaces. In this section, I will explore how I took my pedagogical approaches and techniques out of the classroom and into the world to learn about cars and the car culture of my central Texan surroundings; how I taught my protege to do so as well; and how I re-integrated what I learned from those experiences back into a classroom setting at the University of the Incarnate Word in San Antonio, Texas. I have been interested in the automotive world since I was very young. However, I was drawn to it as an object of study for my dissertation by Rohit, a friend of mine who taught me a lot about bargaining and how to be thrifty. Before I met Rohit, when I needed something done on my car, I always took it either to the dealer or to a chain car repair shop. However, Rohit began to show me how to bargain, which was socially and culturally very new to me. I thought not paying the asked price for something was risking offending someone, and while it was acceptable to shop around for the best price, a given price was never negotiable. The more time I spent with Rohit, the more he began to show me about how to distinguish sincere businesses from crooked ones. He explained how to read online reviews, and encouraged me to ask people who’d personally dealt with a business about their experiences. All of this happened very informally. 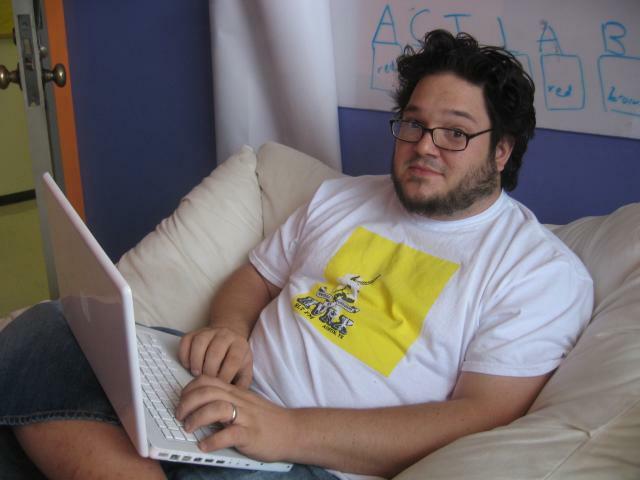 For example, I learned that sales made over the internet weren’t subject to sales tax and often had free shipping when I upgraded my computer. I put my new knowledge into practice when I needed to have my car fixed. The first shop I went to wanted $1,500 to fix it and confidently asked me, “So, should we get started?” Through the example Rohit had set for me, I knew to pick up my keys and go elsewhere. However, I soon began to find that I was able to take the knowledge and skills Rohit had given me one step further. While Rohit had a definite knack for bargaining, I found that deciphering a person’s intentions and determining whether or not they were sincere came very easily to me. I suppose I may have developed this ability over years of watching my dad and my family conduct business. After walking out of the shop that day, I called Rohit’s mechanic, who told me he didn’t work on domestic cars. But persistence was another thing Rohit had taught me, so I pushed the shop owner to recommend another shop I could take my car to. He finally suggested a shop called KC Automotive, which was owned by Ly, a Vietnamese immigrant who turned out to be one of the best mechanics I’ve ever met, even including the famous all-star mechanics I’ve met through my research. Beyond Ly’s ability as a good mechanic (i.e. his ability to not only fix your car reliably but also to take responsibility when a repair he’s made fails), he also had a firm business and family ethic. Through Rohit’s introduction to the social and cultural skills required to bargain, I realized I was becoming a new kind of consumer. Consumption is a basic part of the American identity. The American economy is capitalist. Consumption is the rule in the American game, and while there are ways of playing the game in your favor, it’s important to remember that it’s a game. I often remind my students of this to enable them to begin to cope with their desires to be free-spirited artists in a capitalist, consumerist reality. I’ll typically dedicate at least one full class day to this discussion. While processing these realizations (which took place around 2001 to 2003), I started to integrate my passion for cars with my new found abilities to get them repaired. I began to be less concerned with having a new car than I was with having a car that ran well and that I enjoyed. However, I still maintained my very traditional passion for automobiles. As I’ve explained elsewhere, this passion was driven through magazines, through road racing as a youth, and through my older brothers’ shared enthusiasm for cars. 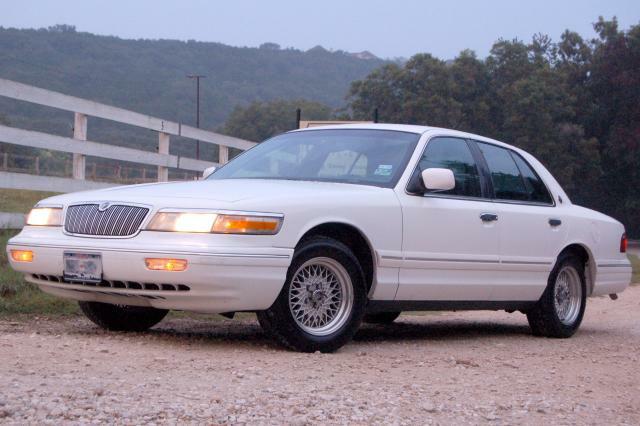 My father’s purchase of a 1996 Mercury Grand Marquis was also a turning point in both my automotive passion and my family’s efforts to achieve financial success. As I’ve mentioned elsewhere in this dissertation, I wrecked that car the year after we bought it, right around my seventeenth birthday. The car came back to me in 2004, when my dad decided he wanted a new car. Since I had recently sold my own car, I seized the opportunity to take it off his hands. The car had 121,000 miles on it and I knew I’d need to maintain it. But the mechanical and bargaining experience I’d gained from Rohit prepared me well. My relationship to the car began to change. I used it for class projects, to cope with personal issues and emotions, and as a way of explaining my identity. A Christine, some might say. (Of course, unlike Christine, my car never tried to kill my wife.) As I drove the car to school every day, I reveled in my relationship to it. 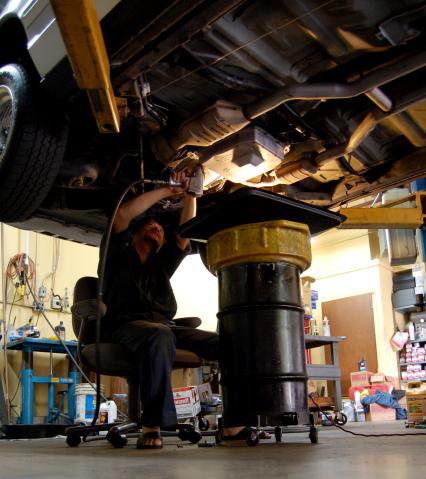 As I made repairs to the car over the years, the idea for my dissertation began to come into fruition. In order to make the repairs, I had to learn about what had broken in order to fix it. I not only needed to research the problem at hand, but also needed to learn about preventative maintenance and performance upgrades. Initially I talked to family and friends about the repairs, but then I discovered online car forums, and they gradually became the primary source of my knowledge. I found forums dedicated to my specific model, with fully documented articles and photos about common repairs and performance upgrades. I read these forums from top to bottom, devouring the information and sometimes even printing it out because I wanted to keep it readily available to me. I later learned that rapidly acquiring information in this way is how geniuses tend to function. As I developed my ability to gather, organize, and analyze information about projects, events, and cultural practices both on- and offline, I came to both enjoy and be passionate about doing so. I combined this passion with the learning style discussed in Transformative Intellectuals to create an approach I call “community to ivory tower and back.” In this approach, I function as a translator between the different bodies of information through which I navigate. For example, I helped my professor find a mechanic and explained to her what to say when she met with him for the first time, and helped my mechanic’s daughter successfully apply to the University of Texas. In both of these instances, I positioned myself as a code switcher between two sets of discourse. I don’t think any of the groups through which I navigated ever fully understood my intentions, both in terms of what I sought to learn from them and in terms of the things I found myself teaching them. I think they simply perceived me as a passionate person who wanted to do great things, though they might not have known exactly what those great things were. I suspect everyone thought I was a little odd. When I began to teach, I took the odd looks I received into consideration. I actively thought about how students with differing socioeconomic and cultural backgrounds perceived me, and I crafted my interactions with them to reflect this. I rejected a traditional student-teacher relationship in favor of a communal learning environment in which the personal experiences of each student are taken into consideration and used to promote a positive learning experience. This may seem quite elementary, so let me emphasize that my approach in the classroom was not to encourage some sixties free love bacchanal, nor did I impose a militaristic rite of passage on my students. This new teaching approach was truly different, but let me come back to that, because there is a missing component that I have yet to allude to. This was actually the social and cultural impact of my researching street racing and high-performance automotive efforts. The impact this research has had on me academically, personally, emotionally and financially has changed my reality forever. 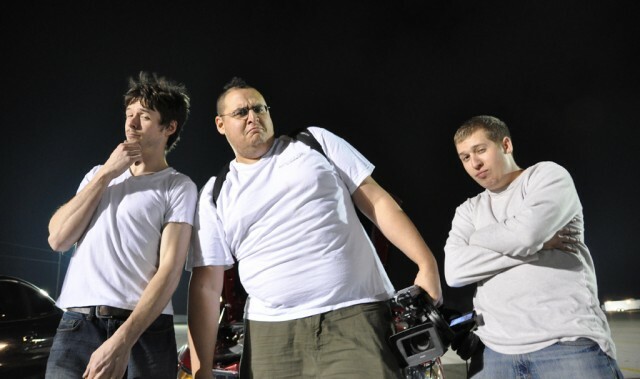 As talked about in my street racing article and my experience with Boost Logic, you can quickly see the social and cultural transformations I went through, being that I was seen as someone who came into the scene as a “big fat Mexican dude with a Mohawk with a slow car”. Working through this cultural baggage was something I had to make an effort to do, especially in the beginning of my research when I was working with the Mustang groups here in Central Texas, as well as some of the street racing groups and online. As tensions were high with immigration issues throughout my dissertation work (2007-2010), being a “Mexican” had certain baggage with various social groups in the car scene. What was interesting about my specific situation was that while I am a “big fat Mexican dude with a Mohawk”, I do not speak Spanish and my English is very “white” as I often have a hard time saying even simple words like “queso” with a Spanish accent. However, as Gloria Anzaldua and other race theorist often talk about, I was in a borderland. Like Edward James Olmos (EJO) said in the movie Selena, “We are too Mexican for the Americans and too American for the Mexicans” (paraphrased). EJO had a point and in the car scene I ran into this as the white people around me openly called other Mexicans and Latinos in general spics, wet backs and other derogatory terms. I would often just stand and listen, much like a traditional anthropologist. If I was in the position of friendship with the street racers I would sometimes remind them I am Latino and they would say “yeah but you are not like THEM”. As I would go through this, sometimes I was just sized up as a Mexican. I quickly found out that the way you gained respect in the social circles was by having a fast car. While my car was fast to me, it was not fast in their eyes (and as I would later learn, it just wasn’t fast in terms of drag racing). So in order to offset this problem, I would make my way into higher social groups by using my “refined” academic stature, telling them how I was a PhD student at UT and talk about my research and how I was just here to listen and learn. This turned out to work well, in that I came across as a non-threatening entity, but as someone who was educated and had good intentions. This process is something that I would later translate into academic speak, something I would use in the classroom in order to create a deeper relationship with my students. It is honest and sincere, it creates a personal relationship while also keeping a professional distance until both parties feel comfortable. Throughout my research I would make many friends this way and in turn they would introduce me to their friends and I would quickly become known as the “cool big fat Mexican with a Mohawk”. By the end of my research I could show up to meets and know no one, when I would start talking to people, they would already know who I am and about my car. This social credibility is something I often related to the idea of being published and known within academia, but with a personal interest that I felt went beyond just papers, but into a quasi personal interest. This interest and sincerity is what I have also taken from my research and used within my relationship with my students, peers, colleagues and “superiors”. My ability to create good lines of communication sincerely and with honest intent is something that has been an over riding theme throughout my life. A lot of it might stem from me being a an Eagle Scout. But a lot of it I believe is through my need to have a “true” social identity. These characteristics also have helped me identify like minded individuals and groups, both within academia and my research. One such group has been my colleagues in the BarCamp scene. 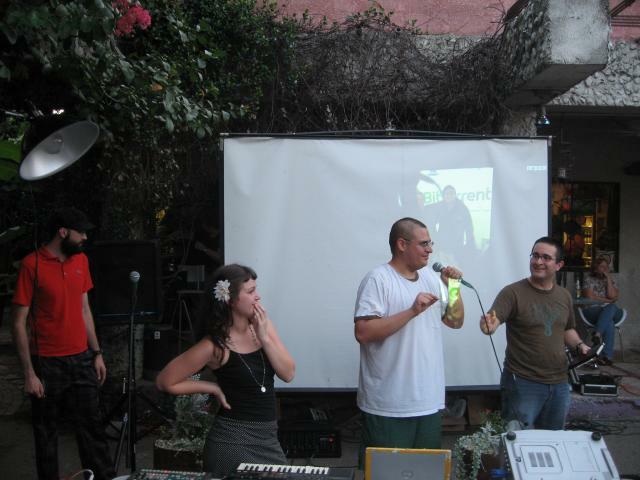 The BarCamp scene is an informal scene that has informal conferences called “Name of Topic” Camp’s. 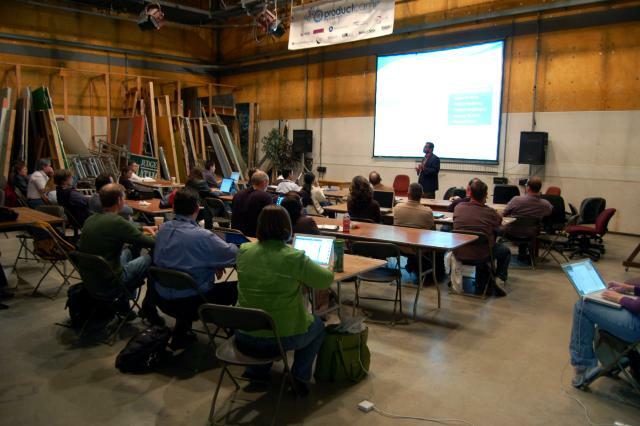 I have helped host, StartUp Camp, Product Camp, Cloud Camp (as in computing) and many others. These camps play off the idea that the creative class (as in Michael Florida’s definition) often share knowledge amongst each other in order to stay up to date. This differs from traditional closed corporate culture in how peoples willingness to interact and share information encourage innovation of the field, rather then treating such information as a corporate secret/intellectual property. The effect is that people who participate begin to work at a higher level of knowledge due to knowledge sharing. This approach resonated with my previous ACTLab experiences discussed in Transformative Inttellectuals. 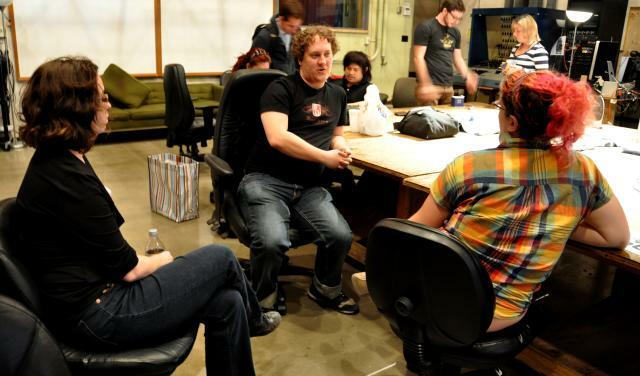 So once I had began to attend and help produce these community style conferences I quickly began to adapt both the BarCamps and my ACTLab classes style. I would talk to the BarCamp participants about how the ACTLab works and then I would go back to the ACTLab and talk about the BarCamps. One of the themes that occur in both spaces is the idea that communal dialog is encouraged and while the presenters are clearly identified, the audiences feedback and participation is just as significant. The practice of creating a space where leaders of information share their information with a creative group in order to further the communities’ general understanding of the field of work is something I believe has value within academia and while such practices have often been seen as useful to the learner, such as graduate and undergraduate research groups and round tables. I believe this practice serves a greater purpose among the “established academic” community. I believe through their recognition of new and innovative ideas coming from not only the “supremely informed”, but from the freshly creative often brings about “‘new” ideas and possibilities. Often in the courses I teach new meaning, ideas and theories about our topics are discovered when an “informed” PhD explains to a graduate student why they are wrong because of the understood/established structures, only to find out they are in fact wrong, because of the same structures restricting their ability to see new forms of thinking about such issues. And to bring this full circle, this type of learning is exactly the type of learning system I experienced when doing my research in the automotive industry, specifically the high performance car industry. The experience I am specifically referring to is when I began my participatory embedded ethnographic research with Boost Logic in north Austin in the early spring of 2009. I became acquainted with the group after meeting their fabricator Marc Evans at a local street meet. Marc had a 1986 300ZX with a 2JZ (a Toyota supra motor) that made roughly 600rwhp at the time. He had fabricated the whole setup, making custom engine mounts, a dash, wiring harnesses and much more. I began asking him questions about the setup and he was very friendly, I told him about my research and he said I should really come by the shop he works at and check it out. So I showed up one day with my Nikon D50 and talked to him and then just began taking photos while he worked. Next thing I knew I was being asked to go to lunch with he and his co-workers and over multiple visits I became friends with everyone there. I would come by at least once a week and just sit around and take photos and sometimes shoot video of them at work. This is one of the first photos I took of Marc working, I gave him a 16″X20″ print a few weeks after taking it. As my Texas Mile and The Magic Car article illustrate I quickly became embedded within the group. I was going to track events and taking photos and videos, making youtube posts, but also just hanging out with them and talking about cars. By late April Marc and I had become good friends. I had posted the Texas Mile and The Magic Car articles on my blog (mygeekylife.com) and they had created quite some interest on the internet. I had car enthusiasts, wordpress site developers and academics all contacting me with interest in how I as developing such a site and also about my writing style of including not only text, but images and video that fully supported the pieces. I have to admit, when I made the Texas Mile article, I knew I was having a “new” moment. I looked at the footage I was creating with my camera and photography and the text I had written and quickly saw I had created a new way of consuming academic information. This new found system is something I quickly began to think about in terms of how my students, peers and colleagues could understand what I was doing, not at just a journalistic level, but at an anthropological one. I was taking traditional anthropological ethnographic approaches and fusing photo and video documentary in with it and presenting the pieces of media not just as artifacts, but as crucial parts of understanding the narrative as a whole. So I set forth and began showing various people my work, such as my committee and what interested me as stated in other articles was that my elders were not used to consuming such media rich long texts online, but my peers seemed to be able to fully consume it. This is a lesson I have taken with me into the classroom. I remind my students to think about their audiences, but not just their current audiences, but their future audiences. Specifically, I had this revelation while speaking on a panel about “hacking the ivory tower” where I had elders of the department questioning my work, but my peers fully understanding my intent. This revelation led me to think through my goals for my work and was something that has changed the way I think about academia, hierarchy and the field progression for ever. But coming back to being in the shop and learning from their practices, the way in which innovation occurred within Boost Logic was a very individualistic/parallel play situation. They would all work on independent tasks and then come together to complete builds. This is not to say they were not trained in each other’s fields, as all of them could do any of the others job, however they had definite “experts” for each part of their business. 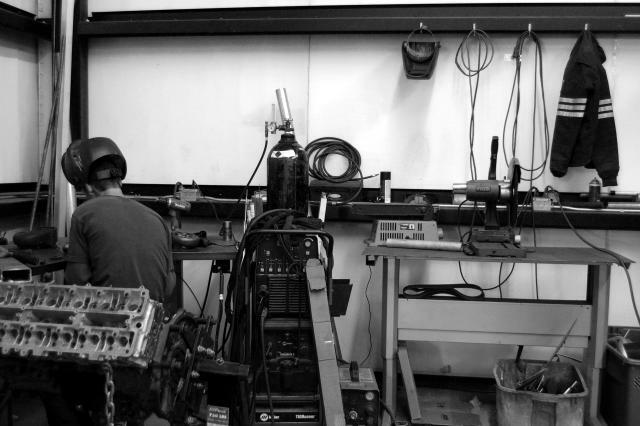 Whether it was sales, fabrication, mechanical repair, engine building or electrical, there were leaders, but also everyone had a standard level of understanding. And this reflected heavily on the weekends when they would all show up to the shop to work on their own cars. They would help each other out, giving advice and direction, but for the most part having to do their own work. This system of work is something I found to be very analogous in the ACTLab where I was concurrently teaching. In the ACTLab we encourage parallel play, i.e. the idea of people working side by side but not together unless agreed upon and tasks are then individualized. I believe having people work in groups unless fully agreed upon by all members often defeats the purpose of harnessing each others abilities due to the loss in productivity through social and cultural differences. At Boost Logic, this practice led to many new innovations taking place in parallel. In the spring of 2009 they had developed two gasoline engine compound turbo automobiles, which after researching has proven to be one of the few examples in the world. 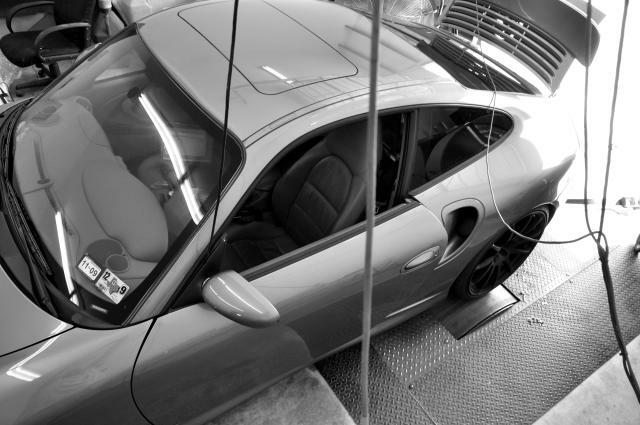 Through their innovative system of research and development they have become a leader in their industry and pave new paths for development of new systems into other platforms, such as developing custom turbo kits for the Nissan GTR and Porsche 911. Throughout this whole embedded participatory adventure I was slowly making way with my own build. When I would go eat lunch with the Boost Logic folks they would often ask me to drive. Having my MGM which at this point had a full suspension setup, I would offer to drive them around since I could fit 4 of them with me. On one of our first lunch outings S.W., the owner of Elite Motorsports, a very high-end exotic car dealership, ended up jumping in my car with everyone else. As soon as we started driving he said “who’s car is this and why are we in it?” I responded it was mine and that it has a full suspension upgrade. As we drove I would lean in the corners a bit to give them an idea of the capabilities. A week later I showed up to Boost Logic and S.W. had a Crown Victoria (CV) just like mine. It was quite a compliment and humbling experience. I will never know if he enjoyed his CV as much as I have enjoyed mine, but what caught my attention was not his taste for such a fine automobile (ok, who are we kidding), but his agility to think outside the box and try new things. This agility to not always have the “best”, but to know sometimes it is the understated that can make an experience in and of itself, was a value that resonated with me. Another thing about these lunches that was interesting was hearing about everyone’s car builds. 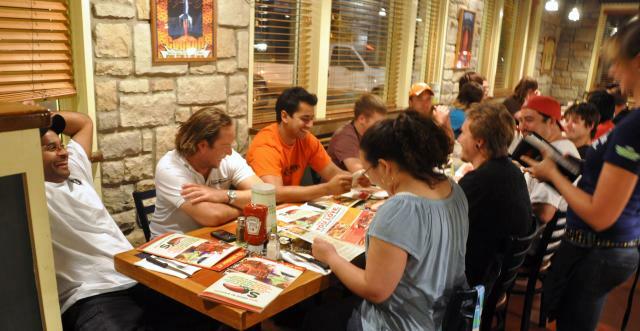 These discussions were usually where ideas and sharing of tips took place heavily. Which reminded me of the relaxed dialog we use in the ACTLab in order to keep creativity brewing. One such example is the chair in our ACTLab office, it is a nice fluffy white chair that we have kept through out multiple re-arrangements. Whenever we work in the office one person is always relegated to the “white chair” where they usually either sleep, play video games or just jam on ideas. This causal position within our work space is a reminder that many times ideas come not from your work, but your play and relaxed moments. One such idea that took place in such a moment with Boost Logic was when I went to lunch with Marc and some friends in my MGM and Marc suggested that we should put a turbo charger system in my car. I laughed, but Marc was serious. When we arrived at my house we popped the hood and he was confident it would be an easy build, two weeks tops. However as I would come to learn unlike my academic pursuits where I usually write a paper, write code, publish media or do some type of white collar work, the effort of implementing a turbo build project turned out to be much more of an under taking then I ever thought possible. I began in my traditional fashion of beginning a project by making a list of required parts, people who would be involved. I contacted all my resources, scouring forums and made calls to suppliers. I came up with a time line and budget. However, nothing would prepare me for so many intangibles during this project. While I had worked with many different types of people, I had never worked with such a physically oriented group in terms of building a project. I quickly ran into problems with sourcing parts, arranging times for us to work on the project. Among many of the things that popped up was the fact that right when I began the turbo build of my car, Boost Logic the company was sold to the lead sales manager and the two original owners left. This change of arms created a new social and cultural hierarchy for which I would have to adapt. As it turned out, the change was not as bad as I thought it would be and I actually was recruited by the new owner to help them with their media campaigns and website. As the project marched on, the days we could work on the car kept becoming further and further apart and Marc began to have his own personal issues that would push the whole project into the late summer and early fall. By the end of the project though I had the whole Boost Logic group helping me build my car. Now I would like to emphasize here that when Marc ran into personal issues, it truly amazed me how supportive and helpful everyone became at the shop. Their wiliness to help me is one of the major cultural and social points of tribal practices in the automotive performance sector that amazed me and showed me how pure will can often over come some of the toughest times. Just like when working on their cars until 12am at night, there they were on a Saturday evening running late into the night supporting my turbo build and all of us coming together to build it. This comradely reminded me of some of the lasting relationships I had created in the ACTLab, but not of any I had ever created in regular academia. It is something I have to come introduce into my teaching style in an effort to help bring a certain awareness to helping each other out with passion and respect in order to help each “make stuff”, “take risks” and “be awesome”, which is exactly what Boost Logic taught me. This is where the T factor came into play. Now the T factor is part of my research and learning that took me and my work into a direction I did not see coming. The T Factor is Kuro Tawil. 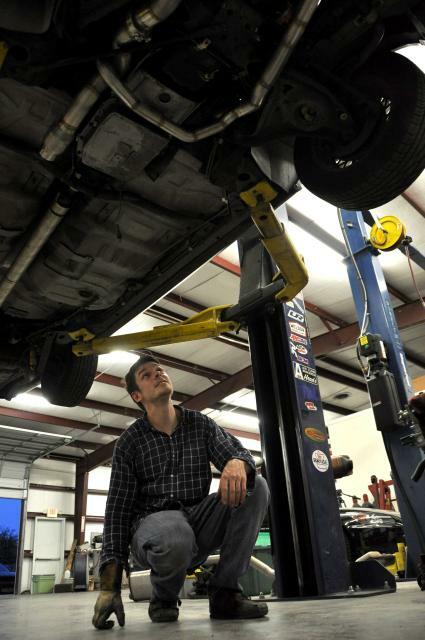 He is a young man I met while working on my Turbo Build at Boost Logic in August of 2009. He had come to the shop with a friend who was having his car tuned. He approached me after one of the workers at Boost Logic told him I knew about ford modular motors. We began talking about his mustang and my car, but soon he told me about how he was a sophomore attending Texas State where he was studying communications. I told him about my dissertation and he seemed sincerely interested. I gave him the URL to my website where my live draft was being hosted and figured I would never hear from him again. However the following Saturday I ran into him at the street meet. I figured he would barely remember me, I was totally wrong. He came up to me and stated how he had read all of my website and was thoroughly impressed. I wasn’t sure if I believed him, but then he talked to me about parts I had written and I could really tell he had. I told him if he was interested in finding out more about my work I would be more then happy to show him around and that maybe he could help me with my research. This was around the same time I was offered a job by the University of Incarnate Word in San Antonio to teach Audio Production once a week. So I decided to ask Kuro if he would like to go to San Antonio with me to visit some automotive shops and see how I conduct my research, as well as go to UIW with me to meet with their faculty. He agreed and next thing I knew we were heading to San Antonio in my Honda S2000. As we drove I talked to him about my research and I also asked him about how he got interested in cars and studying communications. Kuro had a significant understanding of communication theory and car culture. As we would visit automotive shops he was surprised at the various levels of professionalism some of the shops represented. Some shops were literally a guy in a very messy office with parts sprawled all over and a small garage in the back with a TV blaring. Others were full buildings with floors you could eat off of and personnel that were friendly and would give shop tours. When we visited UIW, it quickly became apparent Kuro’s solid understanding of video production, as well as his talent to talk to others effectively in an academic environment. His ability to recognize that it was not important to “know everything”, but rather to ask questions and listen impressed me. After our trip, Kuro and I would end up hanging out quite a bit, his girl friend and my wife referred to our relationship as a â€œBromanceâ€, which was quite entertaining. And in a way, our relationship reminded me of many of the other intense friendships I had throughout my academic career, such as when I worked on peer to peer software development with Brandon Wiley or working with Aimy Steadman on social activism in the technology/geek sector and of course with many of my students such as Praveen Ayagari, who I helped produce a album with and Stephenie Appell a graduate student who helped me with my dissertation and alternative teaching methods. 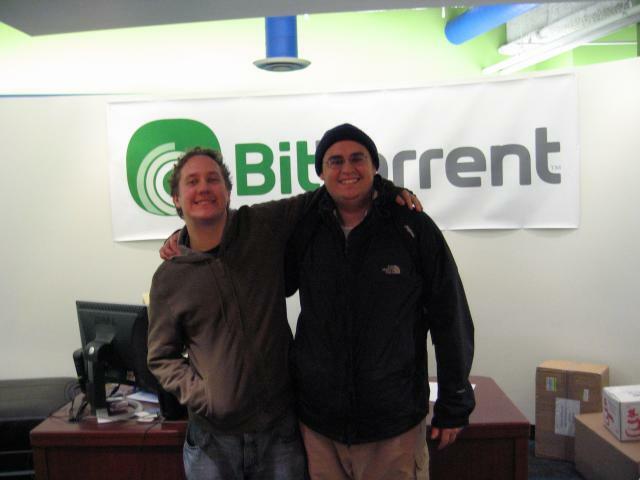 Brandon and I at Bittorrent in San Fransisco doing some consulting. These relationships all became great friendships and ones that I will remember forever. What has been unique with Kuro though took place through our age difference and his ability to understand how to use that to our advantage. Kuro and I had much to learn from each other. 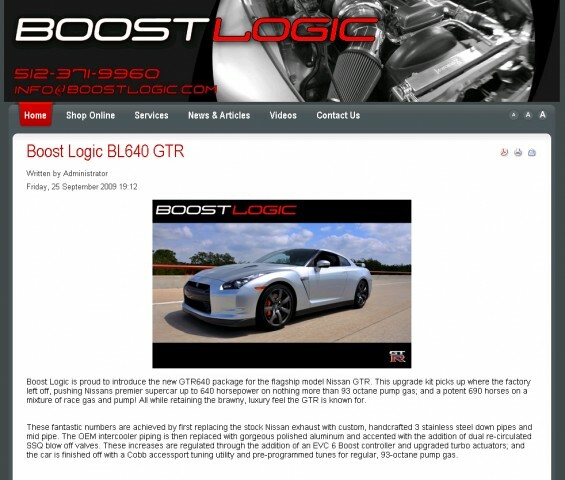 One such experience took place at Boost Logic when Marc had personal issues arise during my turbo build and I was left on my own to build my kit. Kuro showed up with me that week and helped me through the build along with Justin Ninni of Tuning Concepts. To say the least it was a bonding moment for Kuro and I to learn from Justin Ninni how to put a turbo system on my car. We both learned about header wrap and the fiberglass included in such jobs as we itched away and my sensitive skin and respiratory system caused me to get sick. Kuro stuck in there and helped me through the rest of the build and when Marc came back Kuro was still there helping side by side. I ended up having to go to the doctor because of the respiratory issues and my blood pressure was 160/100, my doctor told me if I didn’t lay off the turbo build and my research in general I would only get worse. With that information in hand, I asked Kuro if he could help me make sure my build got done in a timely fashion. And while my build was going on, Boost Logic’s new owner had asked me to help produce some promotional videos. I asked Kuro if he would be interested in such work and next thing I knew we were working together, in a parallel play setting where we were both leading the project, he and I would both shoot video and photos, both edit photos and video and work together on creating press releases for new Boost Logic releases. Through this experience, both Kuro and myself were learning quickly from each other. I would drive through San Marcos and visit Kuro at Texas State every week on my way to teach at UIW. = a truly reciprocal relationship that allows a fluidity in teaching and learning that lends itself to be able to quickly build new ways of thinking through a mutual respect and understanding of each others passion to both learn and teach each other as well as innovate through the passion for the material. This formula is one that I use in the classroom in order to create a relationship with my students where we can establish what is at stake both in terms of academic practice and their aspirations in general. Through Kuro and I venture we quickly went from a traditional student/teacher relationship to a peer to peer relationship where we worked together and came up with ideas and implemented them. One such idea was to begin a joint venture called T&L Media, a small new media group that consults with business’s about their media needs. Kuro and I researched how to start a small business and also researched various market segments. Much like the start up work I had done with Brandon Wiley, Kuro and I quickly became engaged with both academic and professional pursuit of knowledge. This pursuit lead me to bring many of my “war” stories to my students in the classroom. However, what made these stories truly unique was our open grass roots approach mixed with our young age. My students confidence quickly grew and discussions of what the students want to do when they graduate and how to go about making themselves financially viable upon graduate began to crop up. Such discussions surprised and impressed me due to the fact that higher education tends to ignore the harsh realities of graduation for liberal arts/communication students. Through my visits to many regional universities as well as other departments within UT and my own experiences I have found very few programs that integrate life skills of an intellectual into their teaching curriculum. By life skills I mean more then just professional training, such as professional etiquette or job specific training, but more how to be entrepreneurial, how to take your passion and find financial stability in order to pursue it. Through this concept I have integrated such concepts into my curriculum for all my courses, whether it is audio production or trans border violations, I talk with my students how to they will sustain their passion for their art and work throughout their lives. I believe by having such a relationship with the students you are giving them confidence and practical planning skills for when they are faced with the challenges of moving past the classroom and into the real world and in many of my students cases, code switching between the two environments. Such “aha moments” occur in the ACTLab as well, even with the same type of pack/cub play, as illustrated when Drake a community member of the ACTLab helped students build a 555 timer on a bread board. 1. Learning how to be a genius. To many a genius is someone with a natural ability to have quick cognitive skills. Much like a person with a natural physical talent as well. I have found these generalization to hold true, however, I believe there is a large component that many over look when it comes to geniuses, this is their ability to ask questions and look for solutions with a passion and pursuit that often revel at. This inherently points to the fact that geniuses recognize that it is not the fact that they know the answer to problems as much as have an ability to ask questions and try to answer them. The ability to ask questions and have the confidence to pursue the answers is a key element of being a genius and this is a point I bring to my students. I tell them never to worry about asking questions when pursuing answers about their passion and work. I emphasize that mistakes are part of learning and it is the ability to listen to and hear others that will take their abilities that much further, much like any genius. When I am working with â€œgeniusesâ€ I tend to emphasize the ability to verbalize their social and cultural questions in order to better understand not only academic solutions but interpersonal interaction. Through using this approach you can bring together differing social and cultural backgrounds and initiate a creative safe space for which students feel open and willing to share information and help each other through their passions. Now this syndrome deals with the “new student”, aka the techno centric generation. I began to notice this syndrome in the past 4 years as our new students came from a generation of internet users for life. Meaning they were born with the internet “there” and always”on”. Even talk of dial-up modems often alienate/date myself. With this new found comfort with technology and the drop in prices so that most college bound students are now familiar with video editing, photo manipulation and other skills that were once high-level of entry fields are being done in the comfort of their own home, while sitting on the couch and you guessed it, probably in their underwear. Now this new found comfort has pro’s and con’s which directly interact with the Genius talk. Because they are so socially comfortable working at home, the ability to ask questions beyond the internet and the four walls of their apartment begins to hinder their work. They no longer come into the lab to work on the 10,000 dollar computer systems that are being monitored by proctors and TA’s who are ready to help them with their work. This break down is something I tend to address early on in my courses, I emphasize the need to come to the lab if they are running into problems and need to look for high-end solutions. If they are having problems formulating ideas they need to contact us and let us know of their problems. Again we emphasize that having such issues are ok, as long as their openly addressed in a timely manner. Which brings us to point three. This talk is pretty straight forward, but goes a long way with my students. One thing as an academic and a professional media specialist that I have learned is that while I am one to be organized and pace out my work, many others do not. They tend to work best under the “crack of a whip”. While some may find this to be a student issue, I find I run into it in the professional/academic realm just as much if not more. So my way of dealing with it in the classroom is to make it clear that I do not condone procrastination, that I understand it is just how some people work. That being said, I then add that I do condone failure to produce when procrastinating, meaning if you procrastinate, do not ask for help in a timely fashion and fail to produce your work we will proceed to break down your points of your grade accordingly. All too often students’ work suffer not through their inability to have talent or resources, but due to their inability to manage their time. Having students understand time management and work through such issues is something I have found to be rewarding and helpful to producing a creative environment where people with various working styles can come together and share their experiences. 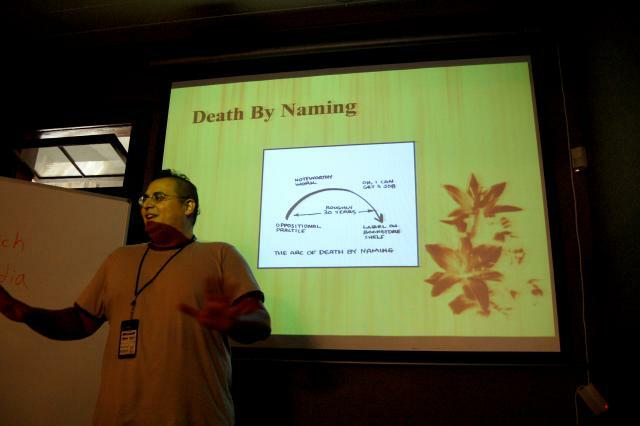 The Journey talk is something I give my students at the very beginning of the course. With so many liberal/fine art courses emphasizing tests, quiz’s, end product specific projects and memorization of text, often times the students have the potential to get into a zone where their work for our classes become secondary due to the fact that our projects are open ended and facilitative rather then dictated. So in order to create a “path” for which they can follow, I have created the idea of “the journey”, where I emphasize that our course is not purely about the projects, but the journey for which you take to create yours. In addition to documenting the process of their project through image, video and text on their website, I ask that they do so thinking about where they started and where they ended; to have a reflexivity with their approach to their work. To think about the journey they are taking with their project, what it means to them and what they think it might mean to an audience. I often also refer to thinking about their journey when presenting their project to their audience, taking the social and cultural practices of their audience into consideration in order to create an involving experience both for themselves and the audience. These are just some of the techniques I have come to implement when teaching my courses about new media topics. However I found them to be useful in the professional realm when working with co-workers, teaching interns and developing business relationships. It has been amazing to be able to perform such a reflexive dissertation. The ability to cross implement my research experience, teaching and professional work with a fluidity has been amazing. From having made friends with street racers that have certain social and cultural values to working with tenured professors developing new media curriculum, I have found that being able to “code switch” and truly listen and also be heard is something I will cherish for life.